The AgustaWestland AW169  is a twin-engine, 10-seat, 4.8t helicopter developed and manufactured by the helicopter division of Leonardo (formerly AgustaWestland, merged into Finmeccanica since 2016). It was designed to utilise a high degree of commonality with the larger AgustaWestland AW139 and AgustaWestland AW189. On 19 July 2010, AgustaWestland formally announced that the AW169 was under development at the Farnborough International Air Show. According to AgustaWestland, the 4.5 ton AW169 is a light-intermediate twin engine rotorcraft intended for a range of utility operations; to lower prospective operational costs, a decision was made early on for the AW169 to share a large level of commonality across both components and the cockpit configuration with the larger AgustaWestland AW139. In 2011, the British Government provided a $33 million loan to AgustaWestland for the AW169 development program. In 2012, the European Union approved a 19-year €272 million zero‑interest loan from the Italian government to AgustaWestland to finance the development of the AW169; industrial research is 40% of the total, and experimental development is 60%, while the aid element is €94 million. On 10 May 2012, the first prototype of the type conducted its first flight. The testing program involved a total of four prototypes; the second and third AW169s joined the flight test program later on in 2012, and the fourth in 2013. AgustaWestland had initially anticipated that the AW169 would receive flight certification in 2014, and had planned for production AW169 aircraft to enter service by 2015. On 15 July 2015, the European Aviation Safety Agency (EASA) issued its certification for the AW169. In November 2015, a prototype was dispatched to various locations in California, United States, for high and low altitude flight tests in support of Federal Aviation Administration (FAA) certification. In February 2016, the AW169 received FAA certification, enabling deliveries of the type to occur later that year. In 2012, AgustaWestland stated that it was planning to produce the AW169 in its facilities in Yeovil, England; the design and manufacture of various components such as the rotor blades, intermediate and tail gearboxes, and tail rotor hub has been performed by AgustaWestland's UK branch. In January 2015, the assembly of the first production AW169s began at AgustaWestland's factory in Vergiate, Italy; initial production models were produced at this site. In 2015, manufacturing activity on the AW169 also commenced on a second production line at AgustaWestland's facility in Philadelphia, USA; the rate of production is reportedly planned to be increased to 20 US-built rotorcraft per year by 2017. However, in October 2016, it was announced that Leonardo, the rebranded identity of AgustaWestland, had decided to abandon work on its planned US production of the type. The AW169 is a medium-sized twin engine helicopter; upon launch, it held the distinction of being the first all new aircraft in its weight category in over 30 years. Weighing roughly 4,500 kg and accommodating 7-10 passengers, it is positioned between the 3,175 kg 8-seat AW109GrandNew and the much larger 6,400 kg 15-seat AW139. The AW169 is powered by a pair of Pratt & Whitney Canada PW210A FADEC turboshaft engines, which drives the main rotor at variable speeds to reduce external noise and increase efficiency. Newly developed dampeners were installed between the rotor blades of the main rotor in order to reduce vibration levels for a smooth passenger experience. It has the distinction of being the first production helicopter of its category to feature electronically-actuated landing gear. AgustaWestland has reported having various customers for the AW169, including air ambulance, law enforcement, executive/corporate, offshore transport and utility sectors. The AW169 is equipped with various avionics systems, including a Rockwell Collins glass cockpit featuring three displays outfitted with touchscreen interfaces, digital maps, dual radar altimeters, automatic dependent surveillance – broadcast tracking, Health and usage monitoring systems (HUMS), and night vision goggles (NVG) compatibility. Many elements of the cockpit and avionics are similar to those installed on the AgustaWestland AW139 and the AgustaWestland AW189, providing a high level of support. The use of a four-axis digital automatic flight control system and a dual flight management system incorporating terrain and traffic avoidance systems has allowed for the rotorcraft to be certified to be flown by a single pilot under instrument flight rules (IFR). There is no auxiliary power unit installed on the AW169; instead, the transmission features a clutch to allow the rotors to be stopped while the engines continue to run to power the avionics and onboard electrical systems. On customer request, the AW169 can be equipped with a comprehensive full ice protection system; alternatively, a limited ice protection system may also be integrated. To meet differing customer's requirements and preferences, the AW169 can be configured with numerous optional items of equipment, such as auxiliary fuel tanks, rescue hoist, cargo hook, emergency flotation aids, external cameras, rappelling fittings, wire strike protection system, mission consoles, external loudspeakers, and external lighting arrangements. In a utility passenger configuration, up to 10 people can be accommodated in the AW169's main cabin, while a corporate transport arrangement can house a maximum of eight people, and a more spacious VIP layout holds six to seven passengers instead. The VIP interior, developed and offered by Mecaer Aviation Group (MAG), features include the Silens noise and vibration-reduction system, the IFEEL In-flight entertainment system, and numerous luxurious cabin refinements. In the emergency medical services (EMS) role, the cabin can accommodate a pair of stretchers while maintaining easy access across each patient from either side, a full medical suite can also be installed. In April 2013, AgustaWestland unveiled the AW169 AAS as its contender in the United States Army's Armed Aerial Scout program. It was the biggest entry with a 10,000 lb gross weight, nearly twice the weight of the Bell OH-58 Kiowa that was being replaced. AgustaWestland stated that its size provided unprecedented cabin flexibility for extended range tanks, command and control facilities, and perhaps manned-unmanned teaming workstations. The size was a potential issue in some respects, such as the number that can be air-transported by a strategic airlifter; AgustaWestland said it had solutions to meet the Army's disassembly and reassembly time limits, and emphasised the type's size and performance values. In later 2013, the AAS program was terminated without any procurement being made. In September 2015, it was reported that the first AW169 had been delivered to an unidentified VIP customer. The launch customer for the AW169 is Lease Corporation International (LCI); by October 2015, LCI had a total of 12 AW169s on order, the first of which being configured to perform offshore operations. In October 2014, it was announced that the Kent, Surrey and Sussex Air Ambulance would become the first Helicopter Emergency Medical Services (HEMS) operator to use the AW169 in the United Kingdom. In December 2015, AgustaWestland and air-rescue operator REGA announced the formation of a partnership agreement to develop a dedicated search and rescue (SAR) variant of the AW169, REGA also ordered an initial three such rotorcraft at the same time. By February 2016, at least 20 AW169s had been delivered to various customers across the world and have been used in roles such as EMS, VIP transport, utility and offshore duties. In April 2017, Leonardo announced it would sell an AW169 to Argentina to serve in the Argentine border guard. Designation for militarised variant, with adaptations for troop transport, utility support, maritime patrol, armed reconnaissance and close air support operations. On 27 October 2018, AW169 registration G-VSKP owned by Thai billionaire Vichai Srivaddhanaprabha, chairman of English football club, Leicester City, crashed shortly after take-off from the King Power Stadium, Leicester, United Kingdom and was destroyed by the resulting fire. All five people aboard the aircraft died, including Srivaddhanaprabha. An initial Special Bulletin issued by the Air Accident Investigation Board (AAIB) has attributed the accident to tail rotor failure after analysing the flight recorder and noting the aircraft failed to respond to the pilots foot pedal commands. In December 2018 the AAIB reported their finding that a rotating bearing at the outer end of the tail rotor control shaft had become seized, causing the shaft to unscrew itself. ^ For NVG operations, a pilot and second crew member is required, both to wear Night Vision Goggles. ^ "AgustaWestland Unveils The AW169". AgustaWestland. 19 July 2010. Archived from the original on 30 August 2011. Retrieved 25 June 2011. ^ "Finmeccanica Reshapes Its Name, Business". Defensenews.com. Retrieved 15 June 2016. ^ Perry, Dominic. "PARIS: Super-medium helicopters close on certification." Flight International, 31 May 2013. ^ "Rotary rebound." Flight International, 20 September 2011. ^ a b Huber, Mark. "Demand Spurs AgustaWestland To Open U.S. Line For AW169." AIN Online, 21 May 2013. ^ State aid: Commission authorises France and Italy to grant aid to Eurocopter and Agusta Westland for the development of a new generation of civil helicopters EU, 7 March 2012. Accessed: 20 March 2012. ^ "INAER Signs Contract for Ten AW169 Helicopters". AgustaWestland. 22 July 2010. Archived from the original on 21 March 2012. Retrieved 25 June 2011. ^ "New Generation AW169 helicopter completes its maiden flight". AgustaWestland. 11 May 2012. Archived from the original on 15 May 2012. Retrieved 13 May 2012. ^ "AgustaWestland AW169 Takes Off". AviationToday. 11 April 2012. Retrieved 25 June 2011. ^ a b Croft, John (20 July 2010). "AgustaWestland unveils 'game-changing' AW169". FlightGlobal. Retrieved 25 June 2011. ^ a b c d Huber, Mark. 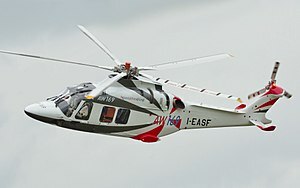 "AgustaWestland AW169 Gets Nod from EASA." AIN Online, 16 July 2015. ^ "AW169 achieves EASA certification with Liebherr technology on board." Liebherr, 27 July 2015. ^ "AW169 Flies Altitude Tests in California." Aviation Today, 27 November 2015. ^ a b "AW169 helicopter achieves FAA validation." Vertical Magazine, 14 February 2017. ^ Perry, Dominic. "IN FOCUS: AgustaWestland brings civil rotorcraft to UK factory as military options dry up." Flight International, 31 October 2012. ^ Huber, Mike. "AgustaWestland Starts AW169 Production." AIN Online, 9 January 2015. ^ Huber, Mark (3 March 2015). "AgustaWestland to build AW609 in Philadelphia". Aviation International News. ^ a b c d Huber, Mark. "AgustaWestland's AW169." Business Jet Traveller, February 2014. ^ Perry, Dominic. "Leonardo drops plans for AW169 production in USA." Flight International, 12 October 2016. ^ a b "LCI Places first AW169 Helicopter for Offshore Deployment with Heliservice." LCI Aviation, 8 October 2015. ^ "AW169 certified as first all-new rotorcraft in its class for 30 years." European Business Air News, 23 July 2013. ^ "AW Readies First AW169 Deliveries." Rotor&Wing, 16 July 2015. ^ Valpolini, Paolo. "Commonality Is The Key To Fleet Growth Options As AgustaWestland Keeps New Helicopters In The Family Way." AIN Online, 8 July 2012. ^ Perry, Dominic. "AgustaWestland considers full ice protection for AW169." Flight International, 7 October 2015. ^ a b "Swiss Air-Rescue Rega orders Three Rescue AW169 Helicopters. "[permanent dead link] Aviation Tribune, 3 December 2015. ^ a b "AW169: Next Generation Versatility." AgustaWestland, Retrieved: 7 December 2015. ^ "MAG unveils VIP interior for AW169 helicopter." Business Jet Interiors International, Retrieved: 18 December 2015. ^ "AW169 EMS and Rescue Services." AgustaWestland, Retrieved: 7 December 2015. ^ "AgustaWestland is In - But is There an AAS Program?". Archived 2 February 2014 at the Wayback Machine Aviationweek.com, 12 April 2013. ^ Outgoing General: US Army Must Continue To Fund Research and Development - Defensenews.com, 14 January 2014. ^ Perry, Dominic. "AgustaWestland cool on development of 10.5t helicopter." Flight International, 30 September 2015. ^ "Specialist Aviation to operate AW169 for KSSAAT." European Business Air News, 9 October 2014. ^ Osborne, Tony. "Rega, AgustaWestland Developing New SAR-Capable AW169." Aviation Week, 2 December 2015. ^ "Leonardo: AW169 helicopter selected by the Argentine National Gendarmerie" (Press release). Leonardo. 6 April 2017. Retrieved 7 April 2017. ^ Maass, Ryan (6 April 2017). "Argentina border guards to buy AW169 helicopter". United Press International. Archived from the original on 7 April 2017. Retrieved 7 April 2017. ^ Dalløkken, Per (13 July 2017). "Nye politihelikoptre skal lages av samme selskap som lager de nye redningshelikoptrene". Teknisk Ukeblad. Archived from the original on 27 July 2017. Retrieved 27 July 2017. ^ Tomkins, Richard (26 July 2016). "Norwegian Police pick Leonardo's AW169 helicopter". United Press International. Archived from the original on 27 July 2017. Retrieved 27 July 2017. ^ "AW169M Next Generation Multirole." Finmeccanica , Retrieved: 23 December 2015. ^ "Argentine National Gendarmerie chooses the Leonardo AW169". helipress.net. flightglobal.com. Retrieved 5 January 2019. ^ "Heli Service fleet". heliservice.de. Retrieved 5 January 2019. ^ Perry, Dominic (12 November 2018). "First sales success for military variant of AW169 helicopter". Flight Global. London. Archived from the original on 12 November 2018. Retrieved 12 November 2018. ^ "Airlift overtek losflygingane etter Lufttransport". Airlift as (in Norwegian). Retrieved 15 August 2017. ^ "Toppmodern ambulanshelikopter till länet". Air ambulance as (in Swedish). Retrieved 26 March 2018. ^ "AW169 helicopter scores first contract success in the US emergency services market - DETAIL - Leonardo - Aerospace, Defence and Security". www.leonardocompany.com. Retrieved 20 February 2018. ^ "Leicester City owner's helicopter crashes leaving stadium". BBC News Online. Retrieved 28 October 2018. ^ "Five dead after helicopter crashes outside Leicester City stadium" International Flight Network, Retrieved 28 October 2018. ^ "AW169: Type Certificate Data Sheet." Leonardo_S.p.A.. 4 August 2016. ^ "AugustaWestland AW169 Emergency Medical Services" Leonardo. Wikimedia Commons has media related to AgustaWestland AW169. Alexa Rexroth (23 May 2018). "Pilot Review: Leonardo AW169". AIN online.